Want to quickly generate more business from Google? We will improve your Search Engine Optimisation (SEO) ranking results and increase traffic to your website. This package is valued at $1,500+gst but, to celebrate some major online successes we’ve achieved for clients recently (see example comments below), we are offering it at just $750+gst. That’s a 50% discount! We guarantee to increase your traffic within 90 days of completing the package or you’ll get a 100% refund. We have been working in the SEO industry for 20 years, so you can be assured of getting a service that delivers. We don’t just talk the talk, we walk the walk. 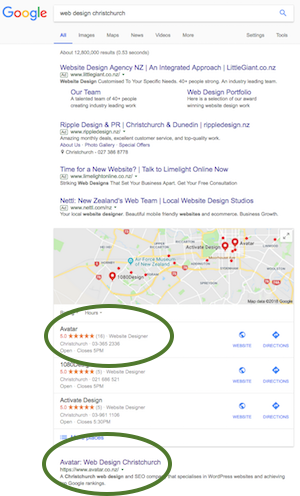 As per the example Google search result screenshot to the right, Avatar is typically in position #1 in the free, non-paid ranking positions for competitive search terms like “web design Christchurch”. These search engine rankings have generated hundreds of clients for Avatar! These key areas will hone in on the largest opportunities to drive more traffic and results to your website. You’ll also receive an email report upon service completion that outlines specifically what’s been done. As an added bonus, the report will include further recommendations and customised suggestions for improving your website’s conversion rates. View more of Avatar’s client comments on Google.